Services of Nine Lessons and Carols will be held in Saint Alban's on Sunday 11 December at 16.00 and Monday 12 December at 19.00. 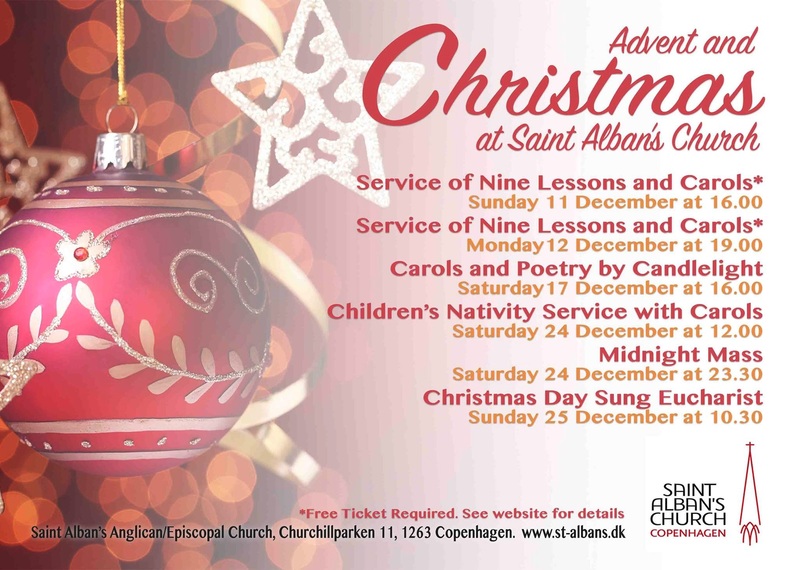 Please check back again for updates on these, and the many other, services and events in Saint Alban’s during Advent and Christmas. All tickets for the carol services on Sunday 11th December and Monday 12th December have been allocated. If any tickets are returned, they will be allocated to people on the waiting list. You might be able to add yourself to the waiting lists using the links on the calendar below. Once the waiting list is full, you are not able to add yourself to the waiting list until people on the list are offered tickets, should that occur. ....why not see what other church services you could attend during the Christmas season. See the list at the end of this page.